AMR / American Airlines seek Chapter 11 protection – Yahoo! Finance » OPShots.net - Cyberhub to Cleveland Aviation and the World! 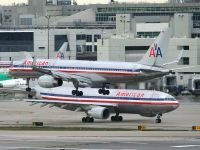 DALLAS AP — American Airlines and its parent company are filing for bankruptcy protection as they try to cut costs and unload massive debt built up by years of high fuel prices and labor struggles. There will no impact on travelers for now.The nation’s third-largest airline also said Tuesday that CEO Gerard Arpey stepped down and was replaced by company president Thomas W. Horton.AMR Corp. has continued to lose money while other U.S. airlines returned to profitability in the last two years.Horton said the board of directors unanimously decided to file for bankruptcy after meeting Monday in New York and again by conference call on Monday night. via American Airlines parent seeks Ch. 11 protection – Yahoo! Finance.